Have you ever seen a book about postcards without any images of the postcards themselves? That might sound strange at first, as one tends to associate postcards with pictures… but truth is, the written content of the postcards is often just as (or more!) interesting than the images they show. 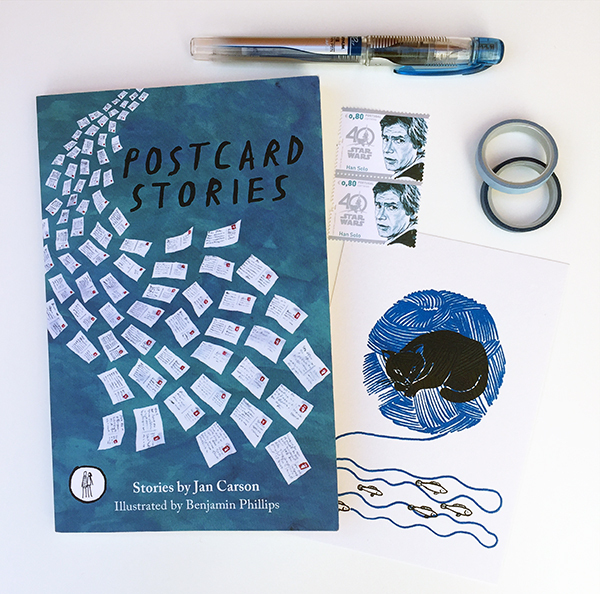 Journalist Jan Carson spent the year of 2015 coming up with short stories for postcards that she sent to her friends and family, one per day. What might have started as a random observation or overheard conversation around her town of Belfast, quickly turn into stories on the back of each postcard, as imagination takes over. The result of this creative endeavour is now compiled in a book called Postcard Stories, where the mini-narratives are interspersed with beautiful illustrations by Benjamin Phillips. A man in the line for Edinburgh has three inflatable worlds in a plastic bag. He is stopped at the departure gate by an easyJet representative. “What have you got in the bag?” she asks. It is seven a.m., too early for lipstick, but she is wearing a thick gash of it: bloody red. “Three worlds”, he replies, and removes them one at a time, clamping them between his feet, because the world is shaped like a soccer ball and inclined to roll if permitted to do so. “One item of hand luggage only”, she states mechanically, already eyeing up the next offender. The man proceeds to demonstrate how, with great determination and a little pressure, the world (and all those back-up worlds to come), can be deflated and contained within an overhead luggage locker." Just picturing that scene put a big smile in my face, and I’m sure anyone who has ever flown on a low-cost airline can picture it as well. The book is filled with 52 such little stories, a collection of Jan’s imagination and mementos that would make any postcard lover happy. Sounds like a really fun book. Wany to be postcard penpals! "Now if only we could make our handwriting as small as Jan’s and fit those many words on our postcards… perhaps she gives workshops?" Ahahah, the first thing that popped up in my head when I read the "example" story. So interesting. A great idea. I like it very much! A good idea! I really like the idea of creating stories on the back of the postcards. I'll have to look for the book. I recently went to a workshop of Jans, we were given a photograph and asked to write a story then sent it on a postcard, I got 192 words on mine, its amazing she can do 300! What a lovely & inspiring idea! Congratulations ,Jan. Hopefully I will bump into this book soon. @triplightly they were issued some weeks ago here in Portugal, to celebrate the 40th anniversary of the movies! I've ordered the book as well, currently out of stock but I hope it will come soon. I would love to see actual examples of these cards with the tiny stories! What a marvellous idea! I'm always on the lookout for ideas for stories. I am excited to receive my copy from Amazon.ca. There were none left at Amazon.com and besides I'm Canadian so it makes sense. Like @fisherman suggested, feel free to try locally, or on bookdepository.com or on other websites that might have payment methods that are be easier for you. I'm afraid we can't link to all of them on the post, but we definitely understand that Amazon isn't the best place to shop in all countries! Hi, I'm hoping on work shops! I love your work. Where can I buy it? That sounds good. For those of you in New Zealand...The Author will be doing a writing workshop in Wellington as part of LitCrawl 2017.